Every workplace needs to test and tag to protect employees, contractors, customers and the general public from electrical accidents. All electrical equipment and safety switches throughout every industry including volunteer organisations and businesses, including community centres, hotels, construction sites, offices, factories, amusement hire. How often do testing and tagging need to be done? 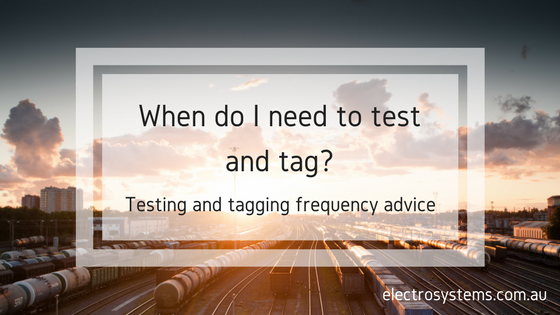 The frequency of testing and tagging varies depending on the type of work being carried out in your workplace and the environment it's being done in. For instance, a laptop being used in a clean, dry office will need testing less often than one which is used on a construction site every day. Industries such as amusement, rural, and construction can necessitate a more frequent testing schedule check with the legislation for specific requirements. Each workplace's individual OH&S reviews can also increase or decrease the test and tag recurrence. Please note - the safety switch and RCD test and tag frequency is different from the electrical equipment requirements. Speak to your commercial electrician for individual industry advice. For more information on the test and tag requirements for your specific business and workplace contact our Brisbane commercial electrical team on 3881 0956 or complete our booking request form today.